This is beautiful. 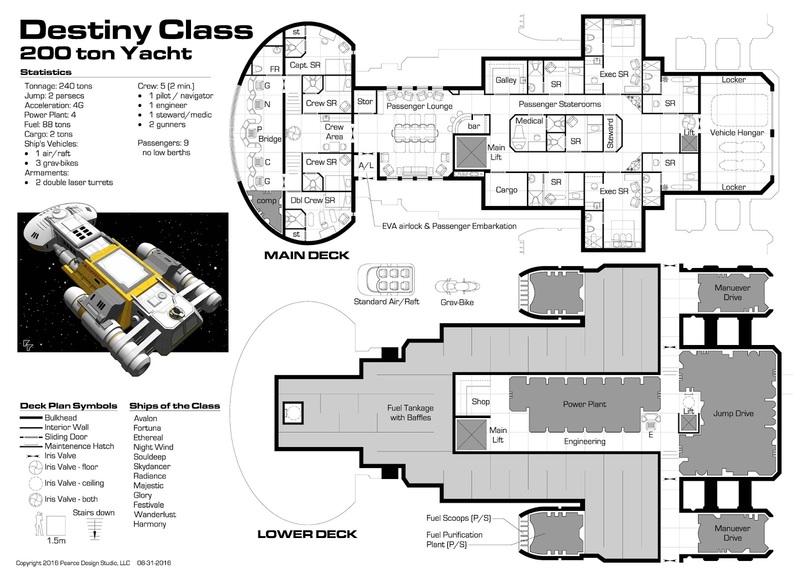 What software are you using to generate the deck plans and the ship image? Thanks for the compliment. Yes, I'm a licensed architect, so I'm using my professional tools for my Traveller hobby. I use AutoCAD for the deck plans and SketchUp Pro for the 3D model, then do some post production work in Photoshop. There are free versions of this software if you look: SketchUp has a free version (although it won't output high resolution images), I've heard good things about GIMP as an alternative to Photoshop. I've never used a free drafting program, but a quick Google search brought up several with good reviews, and AutoCAD provides a trial version and student versions. I've had some reasonably good success using Inkscape. It's free. As a tip for anyone wanting to make decent sized deck plans, just design them in Inkscape, then save to PDF. That will print "posters" which will tile the pages. If you have a Canon TS9000 series printer (or any other like it) you can print borderless which makes for easy tiling. I managed to contact DolphinCad and found out that they occasionally have academic licences available (A universty orders 200 licences and only has 196 machines for example) and they can offer them at academic pricing to the general public. I am thinking of reconfiguring the rear deck to hold the equivalent of a small unarmed aerodynamic space capable VTOL jet and giving it a side entrance rather then a rear entrance. You might still have room for the grav bikes. This way you ca leave the yacht in orbit and use the VTOL for excursions with better performance then a ships boat or the grav bikes. I meant a sideways entrance from the rear. Good luck! I like the idea of the VTOL jet as the secondary vehicle. Don't understand: Only Lifts on a two deck ship. I don't see much reason for the passengers to go between decks anyhow. Also, what if power to the lifts are lost? There's no way to go between decks otherwise. I don't like sounding so negative, because it's a really nice design. Fairly well thought out, and it partitions the help from the passengers effectively. Thanks for your comments. Don't worry about sounding negative, this is not a design I'm terribly proud of. I was trying a different design approach and some things just spiraled out of control. I agree with you about the galley. I intend to swap out the galley and cargo area (which is really just luggage storage) with the two forward passenger staterooms. This will put the galley next to the passenger lounge, put the cargo closer to the main lift, and allow the relocated staterooms to become larger. The landing gear is intended to allow variable height, to sit high as shown in the section, or low with the belly of the ship nearly on the ground, allowing access through engineering while the ship is on the ground. The primary purpose of the main lift is to load cargo and allow passengers to access the Recreational Deck on top of the ship. If the ship is not at a location that has a passenger boarding bridge, the passengers can board via the main lift as well. You make a good point about non-powered access between decks and I'll look into rectifying that if I do an update. At the time I was laying it out I made an effort to keep the passenger areas and crew areas separate, but totally neglected keeping separate circulation between engineering and the main crew area. Deck plans and images updated! as to the 240 tonnage, the design numbers add up to 200 dtons, but deckplans seldom have enough room to depict all components, so the rules allow +/- 20% slop over for things like corridors and stuff in the deckplans. i very much like what you do here , keep the good work. And my first was a Yacht since my Career choice was always Noble if I could and a few or more of my players. I really enjoy your ship designs and have shamelessly stolen a couple for our games. Keep up the good work! Thanks! Glad to hear you are getting some use out of my designs! 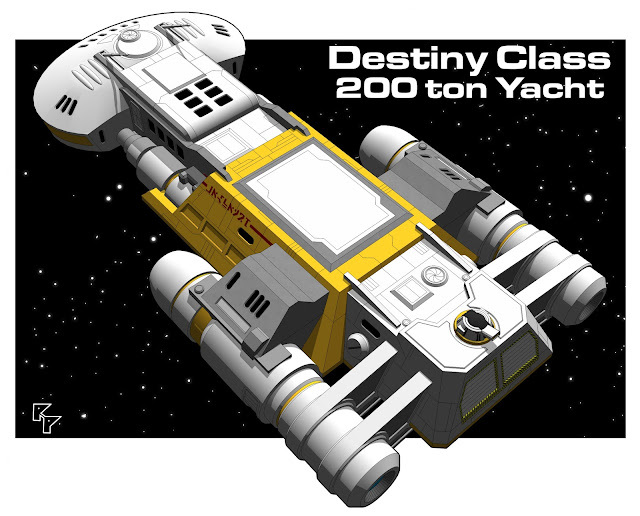 You're allows a 20% variance for deck plans, so 240 tons is right on the money for a 200 dTon ship. Love the design. In reference to the guy who mentioned GIMP, I have to use it at work an I hate it with a passion. Try Affinity Photo or Affinity Designer, they're great, and it's a pretty cheap one off payment.